We’ve combined the healing properties of rosemary and mint with a hint of vanilla to comfort and calm. Our body wash is blended with whole essential oils (instead of synthetic fragrance), and vegan ingredients to gently clean while restoring nutrients and powerful antioxidants to your skin. Daily use improves skin’s tone and texture without drying. We make it easy to do good. 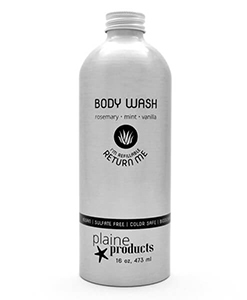 Includes 16 oz aluminum bottle of body wash. At check out you’ll be asked how many pumps you need and whether you have empty bottles at home and need a return label. I am so excited about this product. 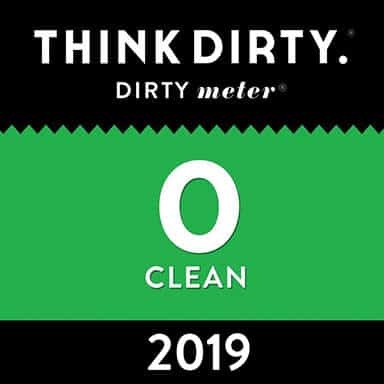 We are trying to cut down on waste and this product does just that. Not only is it environmentally, but it works! My husband and I really enjoy the scent of the Rosemary! We’ve actually cut down on how much product we use because it works that well. Beautiful packaging too! Thank you! I love everything this company stands for, and I LOVE this body wash. I use this, and the body lotion every single day. The search is finally over! I have finally found the perfect combination for me. I’m so glad I found them. Thank you Plaine products! Smells so amazing and isn’t drying at all! Can’t wait to try other products! Love all three: shampoo, conditioner and body wash! Great scent, and my husband loved that they still made suds when sulfate free, great for my children too! 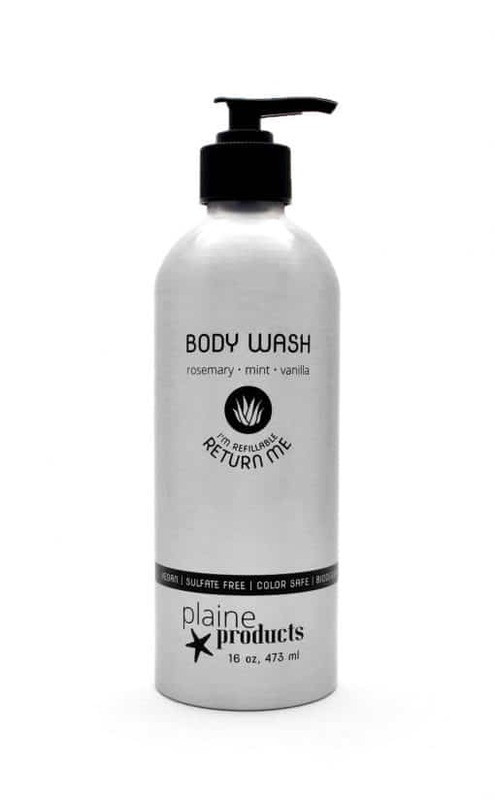 I am sold on Plaine Products! The products arrived very quickly and they are FANTASTIC! I loved the smell and the way that these pure ingredients make my hair and skin feel. Also, the no-waste refill program is so logical for conscientious customers! I will definitely recommend this company and their wonderful products. Excellent products! The Rosemary Mint Vanilla smell is amazing. The body wash is also amazing. Not drying but works for my sensitive and acne prone skin. 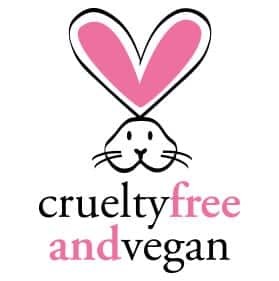 All around great products for a great cause! 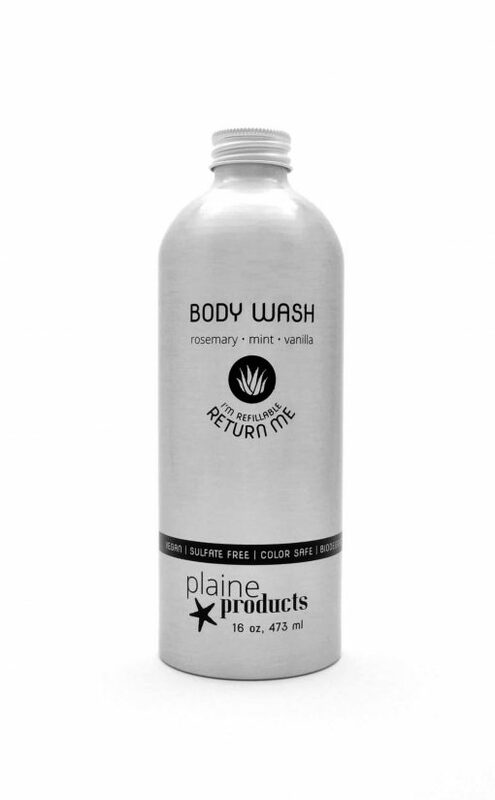 Going plastic-free was what initially attracted us to Plaine, but the quality of the products keeps us coming back! The Rosemary Mint Vanilla smells amazing, and my husband and I both love it. My curly hair has been lighter and less greasy since switching over, and my skin is reacting well to the body wash, too. My husband struggles with dermatitis and has had zero issues since we switched to Plaine. That’s been absolutely life-changing! The subscription is so simple to set up and changing frequency is a breeze. Highly recommended. We are proud of our organic & natural body wash ingredients: Organic Aloe Barbadensis Leaf Juice, Vegetable Glycerin, Saponified Oils of Coconut and Safflower Seed, Guar Gum, Organic Camellia, Sunflower and Ricebran Seed Oils. Chamomile, Sage and Quillaja Saponaria Extracts. Papaya and Pineapple Pulp Extracts. Bamboo Silk, Rosemary Oleoresin, Vitamin E Complex, Organic Green Tea, Geogard Ultra and Potassium Sorbate. Mint Arvenis Essential Oil. Essence of Rosemary, Mint and Vanilla..